December 11th, 2018, Saint Petersburg – Membrana provides investors and traders with a transparent, decentralized and secure system, which controls the process of concluding and executing a contract up to the point of revenue gained by both parties. For the purpose of transfer of an investor’s exchange account to a trader in trust management, an API key provided by the exchange is used. The API key is not transferred to the trader but stored on Membrana’s platform in a secure database. The trader trades on an exchange via the Membrana single trading terminal. Consequently, the trader does not have access to the investor’s assets. All investors’ funds remain on an exchange account and are not transferred to the trader. Membrana also maintains the restrictions set at the contracting stage: stop loss, the time period for trading by the API key, etc. To conclude the transaction between investors and traders an Ethereum Smart Contract is used. Traders’ consideration is reserved in a Smart Contract, in advance, and it is automatically paid upon reaching the target profit set in a percent of the amount transferred in trust management, or upon expiration of the Smart Contract term. All contracts concluded by traders via the Membrana blockchain platform will be saved to the database. This information is further used to calculate traders’ success using indicators, such as ROI, rating, etc. These indicators will be provided to investors, giving them a greater ability to select suitable traders. The Membrana blockchain platform uses blockchain to validate traders’ details. To do this, the hash sum of traders’ transactions for the day is saved in the blockchain Ethereum Smart Contract. The block, where the hash sum is saved, is dated and cannot be counterfeited; therefore, the validity of all data on traders’ transactions of exchange is confirmed by the hash sum in the blockchain — in the block dated with the respective date of the transaction. Thus, it is impossible to save only profitable transactions in the database and the hash sum externally as far as at the moment of saving, because it is not known which transactions are profitable. 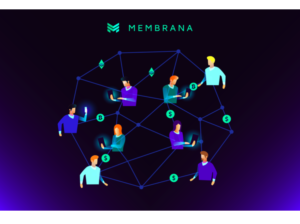 The Membrana blockchain platform allows the investor to transfer, to the trader, only part of his funds in the exchange account, as is stated in the contract terms. The remaining funds remain under the investor’s full control and can be used for independent trading, transfer of these funds to another trader, or withdrawal from an exchange account. Trade in cryptocurrencies is actually carried out from one exchange account by different traders or by the investor himself. In spite of this, the Membrana blockchain platform provides isolated and independent trading within the amounts transferred to trust management for each trader and the investor himself. At the time of the conclusion of the contract, the investor determines the amount transferred from trust management in the accounting currency to be used. Membrana’s Pre-Sale will start at 6 PM (GMT 0) on the 10th of December. To take part and take advantage of the bonuses up to 70%, visit the website. On the first day of the presale, early contributors can expect up to 70% gradually decreasing to 25% in weeks 7 and 8. There is a total supply of 1,000,000,000 MBN but 137,5000,000 MBN have been made available in the presale. Membrana.io is the source of this content. Virtual currency is not legal tender, is not backed by the government, and accounts and value balances are not subject to consumer protections. Cryptocurrencies and tokens are extremely volatile. There is no guarantee of a stable value, or of any value at all. Token sales are only suitable for individuals with a high risk tolerance. The post Membrana.io – A Trust Management of Digital Assets Platform Announces Start of Token Sale appeared first on Bitcoin PR Buzz.